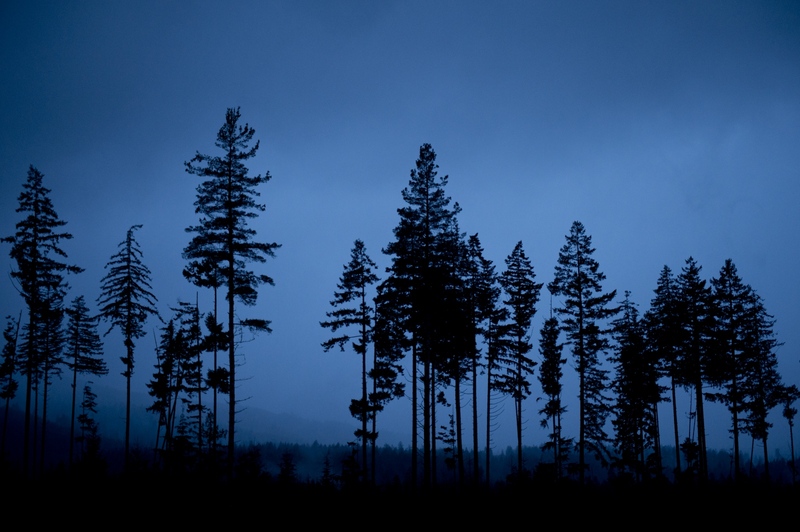 Trees are silhouetted near the SIRM dump site before sunrise on Dec. 12, 2015. Since the start of dumping in November, opponents have set up blockades in the early morning hours to stop trucks headed to the site. 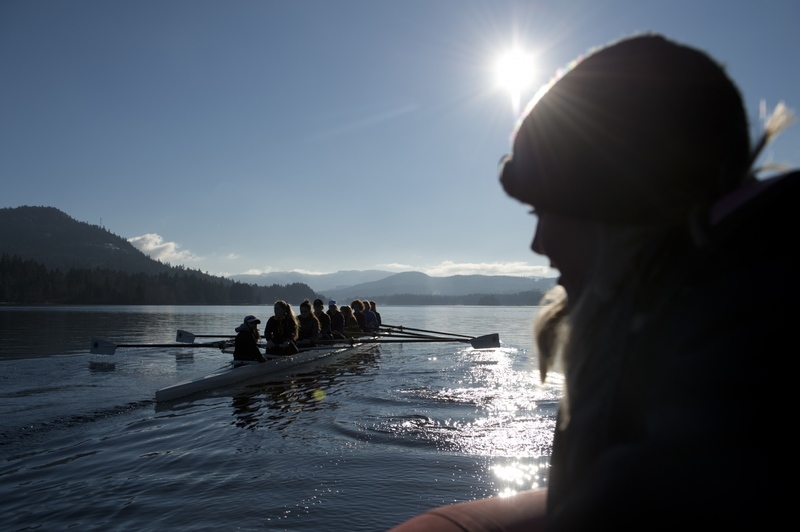 Shawnigan Lake School student rowers sit in a coxed eight during practice on Jan. 9, 2016. The lake is home to two boarding schools, Dwight School Canada and Shawnigan Lake School. The lake is also training grounds for Rowing Canada. "I don't think there is a kid that can go through their education at the school without experiencing the lake in a positive way," Colin Mattock, teacher and coach at the school, said. 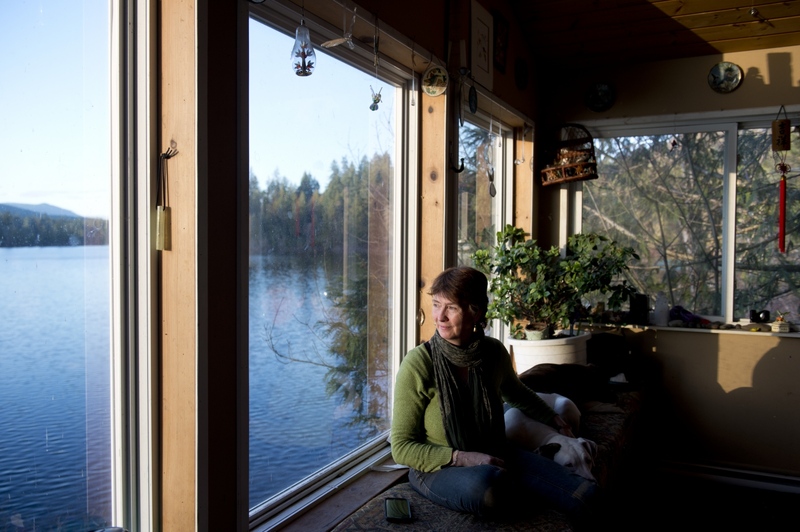 Shelagh Bell Irving looks at Shawnigan Lake from her home on Dec. 11, 2015. Bell Irving was one of the first recipients of an injunction preventing protestors from blockading trucks headed for the SIRM site. "My grandmother told me from the time I was a little girl that I was here to protect the water," said Bell Irving, whose family has owned property on the lake since 1941. "I can't stop [protesting]. There's been many times I've been so tired from talking about this... I just want this to be done but I can't stop until this is done." 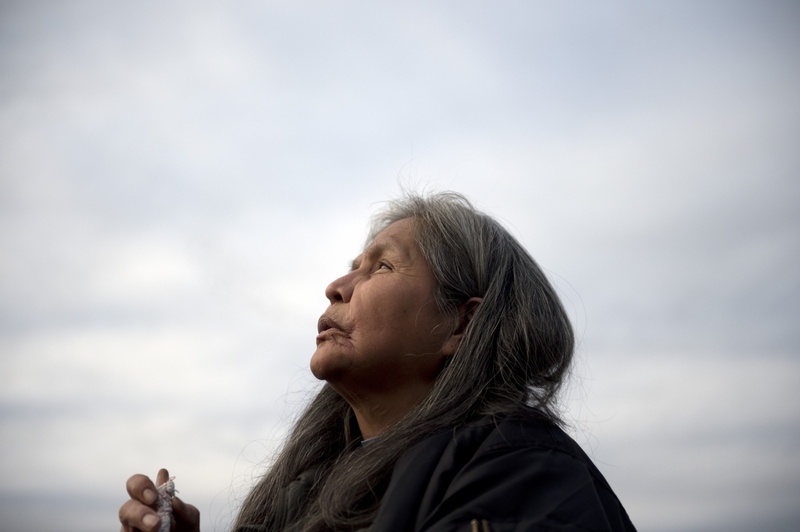 Rose Henry, of Victoria, B.C., participates in a sacred pipe ceremony in Shawnigan Lake, B.C., on Sunday, Feb. 7, 2016. Members of the Shawnigan Lake community gathered to watch and take part in the ceremony of healing. "We are here defending our most sacred thing — the water," Henry said. 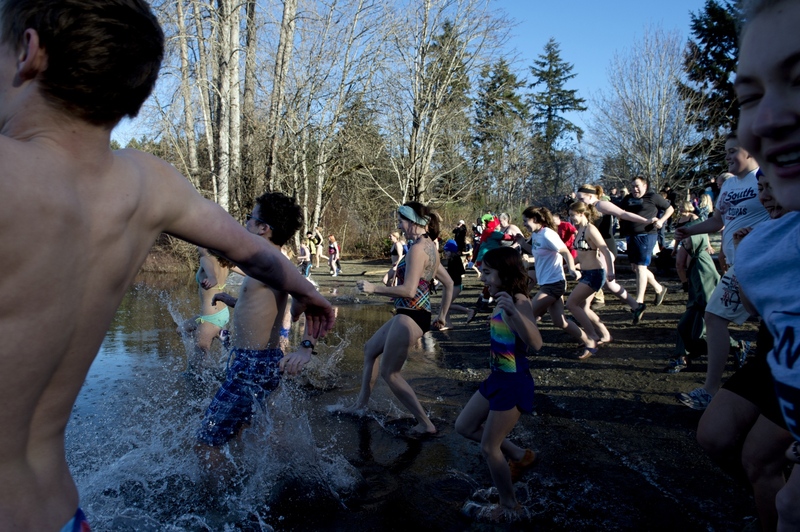 Residents participate in the third annual Shawnigan Shiver on Jan. 1, 2016. Located between the cities of Nanaimo and Victoria, Shawnigan Lake is a popular recreation destination in the summer months. 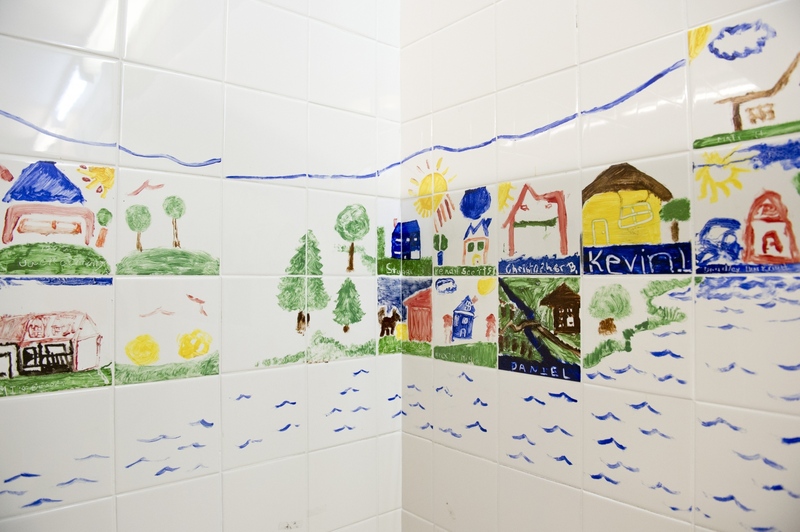 A mural is seen at the Shawnigan Lake Community Centre on Dec. 9, 2015. Snow covers the South Island Resource Management site on Jan. 6, 2016. 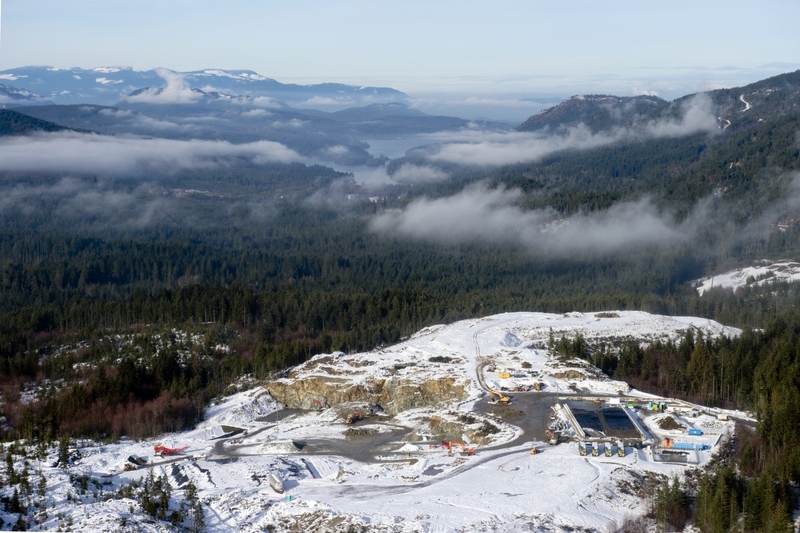 Residents question the wisdom of putting a contaminated soil dump site only five kilometres south of, and uphill from, Shawnigan Lake (pictured above). Water flows from the South Island Resource Management site into an ephemeral stream on the western perimeter of the site on Dec. 9, 2015. 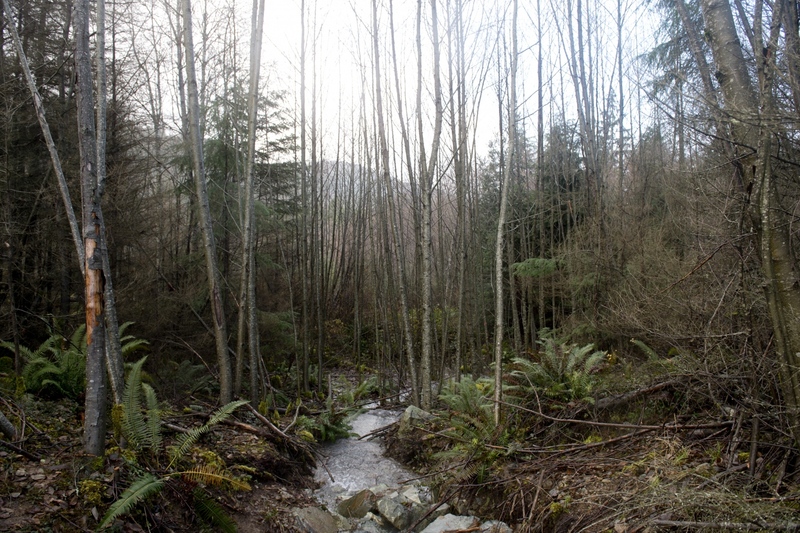 The stream flows directly into Cowichan Valley Regional District land. As per the permit, all water — including contact water, or water that has come into contact with contaminants — is to be treated before being discharged into the ephemeral stream. The stream joins Shawnigan Creek, which flows directly into Shawnigan Lake. Residents are concerned water is not being treated properly prior to being discharged in the stream, where a breach occurred on Nov. 13, 2015. The breach led to a "no water use" advisory from the Vancouver Island Health Authority, affecting residents on the southern end of Shawnigan Lake. Luke Cross, of Duncan, collects water near Lot 21 on Jan. 1, 2016. Cross is a vocal opponent of the site and posts regular videos on social media to spread awareness. Lot 21, which is adjacent to the South Island Resource Management site Lot 23, is owned by Cobble Hill Holdings. In Oct. 2010, over 1000 tonnes of contaminated soil was dumped in Lot 21 without a permit. The leachate from Lot 21 flows directly in Shawnigan Creek, which later flows into Shawnigan Lake. Lot 21 has been a point of contention between SIRM and the residents of Shawnigan Lake. Todd Mizuik, co-owner of SIRM, maintains the site is dormant. He has also criticized protestors for using leachate from Lot 21 as a key message, claiming the water's colour is solely caused by naturally-occuring iron bacteria. Residents, on the other hand, cite studies showing high levels of thorium, lead and other heavy metals in the leachate from Lot 21. 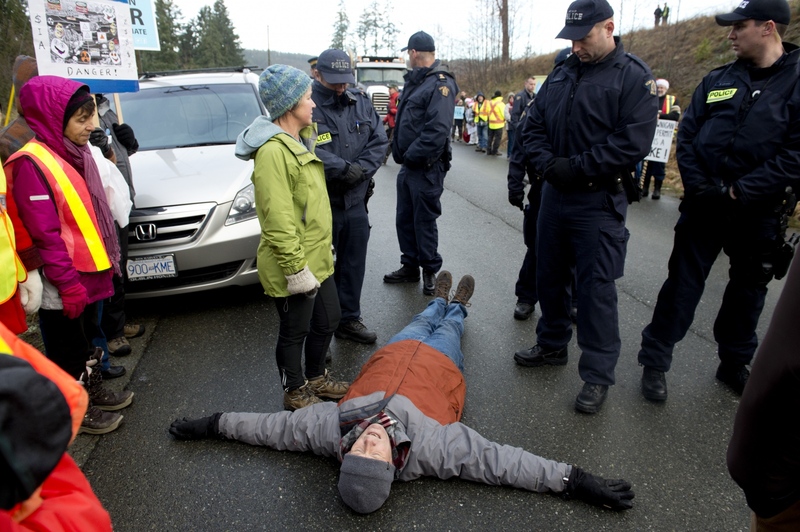 Bruce Stevens, of Shawnigan Lake, lies on the ground to impede dump trucks headed for the South Island Resource Management site on Dec. 22, 2015. 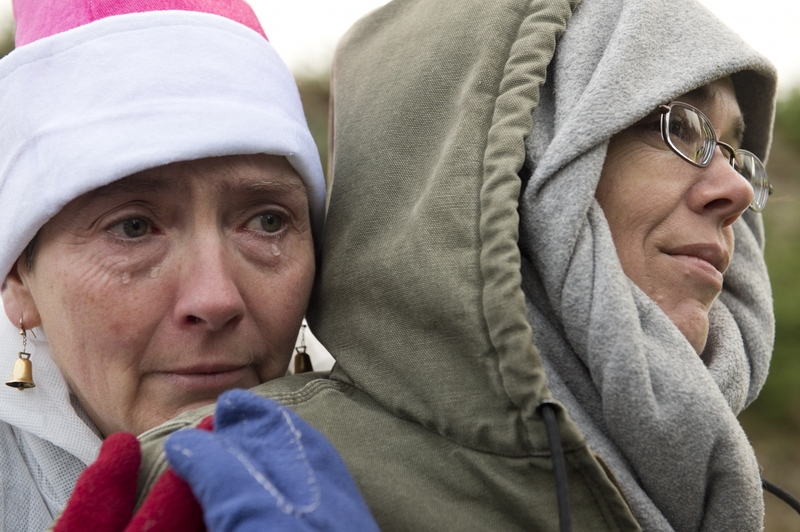 Residents gathered en masse on Dec. 22 to block trucks for two hours, resulting in nine arrests. 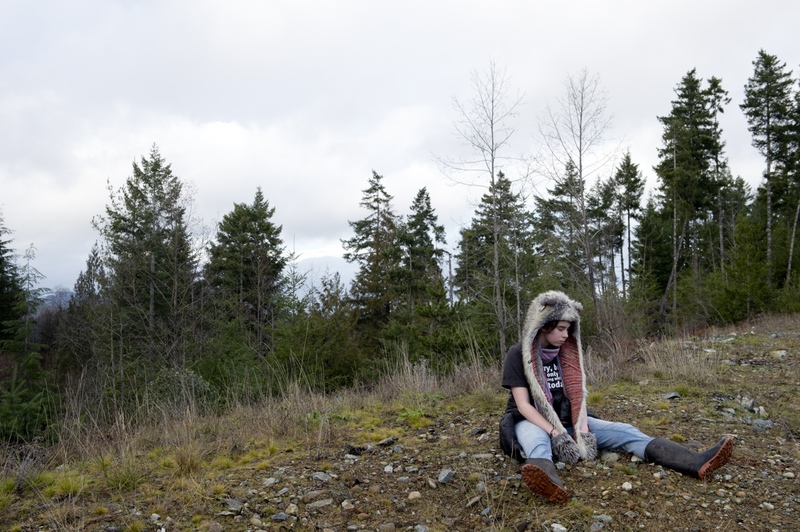 Claire Keen, 15, of Shawnigan Lake, rests during a public tour around the dump site on Sunday, Dec. 20, 2015. In 2011, residents of Shawnigan Lake, B.C., learned of an application for a permit to receive contaminated soils at quarry site Lot 23. The site was owned by Cobble Hill Holdings (CHH) and operated by South Island Aggregates (SIA) — companies managed by the same owners. 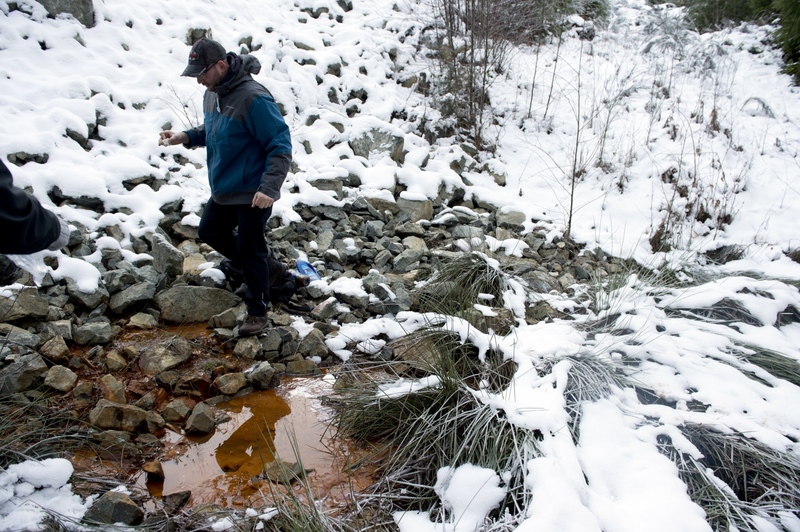 Residents immediately raised concerns: the site is five kilometres south of, and uphill from, Shawnigan Lake — a major watershed for about 12,000 people; there was insufficient testing; there was too much uncertainty about the area's geology and hydrogeology. Despite their concerns, the B.C. Ministry of Environment granted the permit in August 2013. The permit, issued to CHH, allows the site to receive 100,000 tonnes of contaminated soil per year for 50 years. The soil can originate from anywhere in the world, and can have high levels of sodium, metals and hydrocarbons — substances with known links to cancer and damage to the nervous, reproductive and immune systems. Residents appealed the decision but in March 2015, the Environmental Appeal Board upheld the permit. In April, a company named South Island Resource Management (SIRM) was incorporated to operate on Lot 23. In July, residents obtained documents alleging fraud, including a profit sharing agreement between CHH, SIA and the engineers hired to assess the site for the permit application. The trucks started dumping in early November. Two weeks later, a breach from the site resulted in a "no water use" advisory for residents. Opponents to the site organized to fundraise, spread awareness and block trucks headed for the site.